And it is true - emacs documents itself and there is help available all around. I only fully appreciated the extend of this after years of using emacs, so I hope this will help other - I hope others will forgive me my long ignorance... Anyway, even though this is an impressive list, it's not complete. It's just the list that I have used at some stage. Many of the help options have key bindings (shortcuts) that start with C-h (Ctrl+h). Read the emacs reference manual: press C-h r, run the emacs tutorial with C-h t or read the emacs FAQ with C-h C-f.
You can also get a list of all current key bindings with C-h b. Maybe you find to find about a Lisp-function, but you only remember its name was someting with 'foo'. Press C-h a; then type foo and you get a list of all commands with 'foo'. If you need help on a specific Elisp function, press C-h f; it defaults to the function the cursor is currently on (if any). "here's my docstring: this function says 'hello' in the echo area"
Now, if you look for information about say-hello, emacs will give you its docstring. There's also a variant C-h F (capital F), which looks up the information for a function in the emacs-manual; note that it would have been more useful to use the ELisp-manual instead, if that is installed. Similarly, you can information about Elisp variables and constants with C-h v (with C-h V to get information from the Emacs manual). There are describe- functions that may be useful; just press M-x describe-TAB to see what's available. 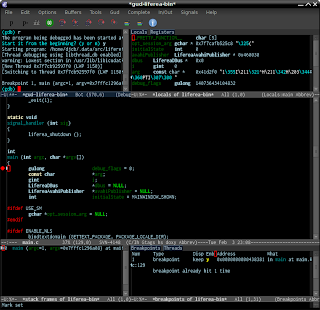 It may not be so useful, but emacs23 allows you to manipulate the transparency of your emacs frames (windows). If you use Windows or X with a compositing window manager on X, you can make your windows transparent. 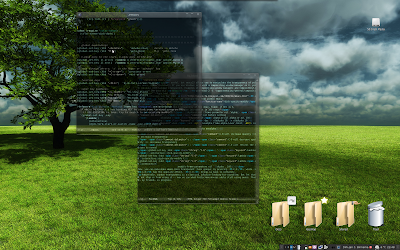 Examples of compositing window managers are Compiz/Beryl and even the good-old Metacity (gconftool-2 -s '/apps/metacity/general/compositing_manager' --type bool true). decrease the transparency, otherwise increase it in 10%-steps"
Now, you can make make emacs more transparent (less opaque) by pressing C-9, while C-8 has the opposite effect. C-0 brings us back to normality. Admittedly, window transparency is a classical solution-looking-for-a-problem. But let that not stop us from using it -- now we can watch full-screen movies while still using emacs. That, my friends, is progress. I wonder why it's not the default. ('prospects') will shrink to the ones with matching substrings. '("\\` " "^\*Mess" "^\*Back" ". *Completion" "^\*Ido" "^\*trace"
the cursor to the variables and enter C-h v). I guess I should spend some time to master it. 'flow', so all the tweaking might be worth it. I am usually a bit skeptical about putting too many GUI-distractions between me and my code, but this is really useful! All the information I need at my fingertips. Emacs is a place full of hidden treasures. If you are new to gdb, I would recommend you to read the GDB Tutorial, and after that the GDB User Manual. Gdb is a very powerful tool, but it requires some learning. Just like emacs.